Cheltenham chairman Paul Baker has said any players not giving their all for the club will not be given new deals. 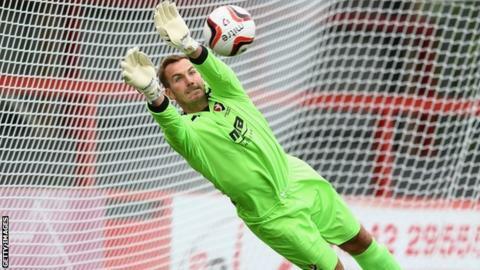 His comments came after goalkeeper Scott Brown publically criticised two of his team-mates after Saturday's defeat by Rochdale. Brown said the two players in question had admitted to manager Mark Yates in training they had "not been trying". Baker supported Brown's statement and added: "I don't want players like that playing for Cheltenham." The Robins chairman told BBC Gloucestershire: "If we are able to identify the players, they won't be playing for Cheltenham again. "I've not researched what we can and can't do - I don't know the circumstances. "But when we are paying them a lot of money, and fans are paying money to watch, and under their own admission they're not trying, that has got to be a reason for us not renewing their contracts." Saturday's result saw Rochdale promoted and inflicted a 16th defeat of the season on League Two Cheltenham, who were play-off semi-finalists last year but can finish no higher than 11th this term. And during his post-match interview, Brown revealed: "In training on Friday, the manager went around and asked players if they were trying and two said 'no'. "I could bring my mate from the pub along and even he would run around and try his best. "To me it was obvious one or two weren't trying and that's not the gaffer's fault, there is nothing he can do. It's just unacceptable behaviour to come into work and not give everything every day. "There is going to be a lot of footballers out of work this summer and if you are fortunate to be a professional you have to take every single opportunity." And Baker went on to praise Brown for speaking out against his own team-mates. "Our success over the years has come from players mucking in and working hard. One of the problems we've got this year is we haven't got a squad with togetherness. "That's something we will be addressing."